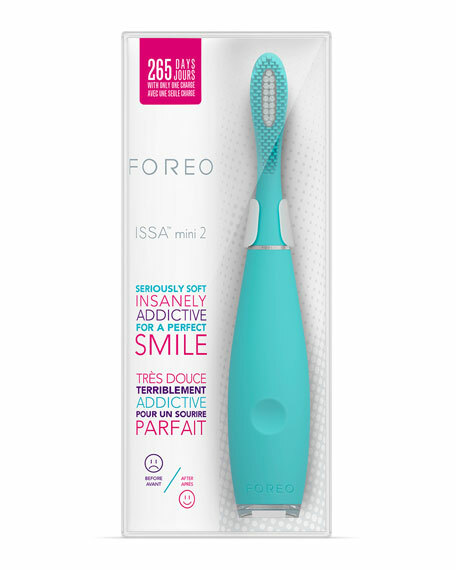 ISSA mini 2 is an electric toothbrush created for kids (aged 5+) and adults who prefer smaller brush heads. 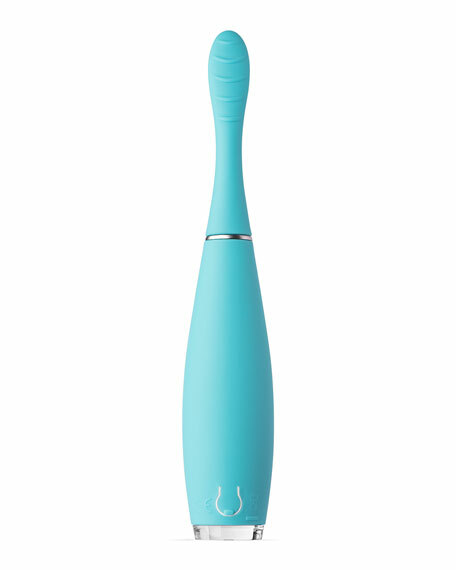 A fun and bold silicone brush now features twice the power of Sonic Pulse Technology and a hybrid brush head to brighten, whiten and polish your smile. The hybrid brush head's inner PBT polymer bristles remove plaque build-up while the outer silicone bristles comfortably massage the gums and inhibit over-brushing, preventing gum recession and damage to tooth enamel. The ISSA mini 2 sonic toothbrush features Smile Helpers to encourage proper oral hygiene habits. A Glee (happy face) will appear after 2 minutes of brushing, both Glee and Glum will light up if you haven't brushed for 2 full minutes and "Glum (sad face) will appear if you haven't brushed for over 12 hours  a great way for parents to keep an eye on their kid's brushing habits. Lightweight, waterproof and easy to carry, ISSA mini 2 is USB-chargeable with each 1-hour charge lasting up to 1 year of use. Every ISSA mini 2 electric toothbrush comes with a 2-Year Limited Warranty and 10-Year Quality Guarantee. Foreo puts technology in your corner with the innovative line of beauty solutions. Best known for the iconic Luna® facial cleansing and anti-aging device, the Foreo brand is committed to providing you with groundbreaking technology, impeccable service, and beauty solutions that live up to their promises. With smart, effective, and simple products you're sure to enjoy the Foreo results.